To do this exercise you will need a soft ball. Start by standing on both feet with the soft ball between the medial malleolus of each ankle. 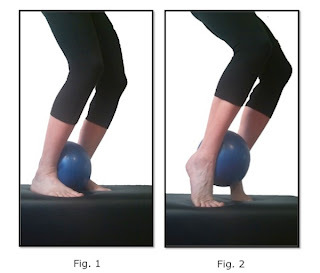 Be sure that the weight is distributed equally on both feet. Next bend both knees while keeping the heel reaching towards the ground. Then keeping your knees bent exhale as you lift your ankles while maintaining equal pressure on the ball. Inhale as you slowly reach your ankles to the floor and then exhale again as you lift your heels away from the floor. Repeat 8-10 times. Once again, it is important to be sure that your weight is distributed equally on your feet and that your knees are tracking over your second and third toes. Also be sure that your posture is upright and that your spine is reaching towards the sky.